Have you put in your 2 hours of volunteer effort yet? Have you paid an opt-out fee? If so, THANK YOU! If you had the best of intentions, yet have not put your time in, please visit the FDC website and scroll down to the bottom of the page to link over to sign up genius. Choose one of the very few remaining slots, or email Tamara and ask her to put the, “I opt-out of volunteering with no guilt”, $35 fee on your account. If you have ever been to a truck unload at any depot or worked any shift; especially opening and closing, you know just how much effort goes into every distribution. The discussion of volunteerism came up at the last board meeting and one member mentioned that we seem to run so smoothly that we may appear to not need help. While that is indeed flattering, it is far from the truth. We are a cooperative, and while we do have paid staff, we need the efforts of all members to be able to run efficiently. There is a list on our website including newsletter articles, food demos, share deliveries, farm tours, canning classes, restaurant reviews, recipes, truck unloading, depot set up & breakdown and other ways to volunteer. Volunteering has also been proven to benefit volunteers in surprising ways and our members attest that volunteering is fun and fulfilling! Plus for every 2 hours of time given to the coop, we give you one entry into the drawing for a free December Share! At the beginning of the season, the bins are light and easy to manage. As the season progresses, they get heavier and heavier. The rest of the regular season likely will not match the weeks we were loaded down with watermelon and cantaloupe, but the items from here on out shout AUTUMN and are plenty heavy! We recently scooped up butternut squash for all Veg Shares from Lakeside Organics / Czajkowski Farm. Joe sent a few beautiful pie pumpkins as a sample to let us know his crop was in. These items take a crew to move. If you still need to fulfill your volunteer hours, you can also head to Marblehead at 1pm on Tuesday or Thursday to help unload the truck these last few weeks – they’re heavy! Watermelon Toss Volunteers & Staff – check out the video on Facebook! 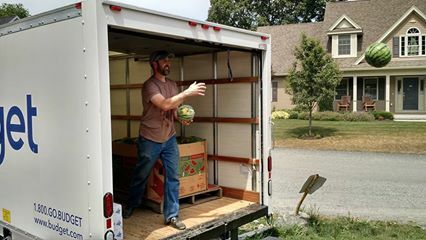 This entry was posted in Member Stories, Volunteer and tagged coop committment, truck split, volunteer, watermelon toss, watermelon video by Jennifer Moore. Bookmark the permalink.